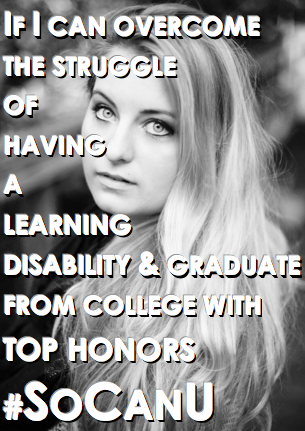 Featured below is an interview with another #SoCanU project rockstar, Sarah! Sarah graduated from Lake Sumter State College May 2014 and is currently pursuing her bachelor's in global business at the University of South Florida. Lay out in the sun with some friends or go to the beach and relax. Anything Italian... sooo I'd say chicken Alfredo! So I could stay home, save money, still be with my friends and family while I needed to grow up a little. I really struggled in math when I got to college. I didn't like math all my life, until I had an amazing professor. I went from remedial math to calculus! I even tutor math now. I also have a learning disability called dyslexia. It is a reading learning disability that can hinder a lot. I never let that be an excuse and never will even though I will have this disability my entire life. What is most exciting is that I have so many goals and I'm already fulfilling them. The crazy part is, is that I have no idea where life with take me and I'm okay with that. Never give up, don't let others make decisions for you. Don't be a follower, if you have something to say...say it! You can do anything you set your mind to, if you really want it.